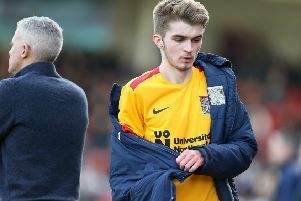 Cobblers boss Keith Curle admitted he felt a tinge of disappointment that his side were unable to turn one point into all three against leaders Lincoln City on Saturday. Town fell behind to Bruno Andrade's 27th minute opener at Sincil Bank but they then played 50 minutes against 10 men after Harry Anderson was shown a straight red card for a poor tackle on David Buchanan. Aaron Pierre levelled five minutes later and that was how the game would finish, with neither side really able to create any clear chances in the second-half. "It's not often you come away from home playing against top of the league and you feel a little bit disappointed with a draw," said Curle, whose team remain 10 points clear of the League Two relegation zone. "That's probably because of their sending off and the extra man advantage that we had, but I don't think we used the advantage well enough and I don't think we were smart enough at times. "But credit to Lincoln, they dug in and you can see some of the qualities they've got which show why they're top of the league. "We didn't test their goalkeeper enough in the second-half, especially as we had the wind advantage as well, but that's just the excitement, the nervousness and the anxiousness of the game." Added to the victory at Tranmere in midweek, Town have collected four important away points on the back of last Saturday's heavy home defeat to Colchester. "It's easy to say we needed a reaction from last week but we have to make sure there was enough desire and enough character to have a positive reaction to Colchester," added Curle. "Today we accepted the challenge as a group and that was pleasing."